There has been a lot of progress and not without a couple of bumps. But we are hoping against hope that we will be able to move into the new house in the early part of November. It’s getting a bit chilly up here in the cabin. This morning temperatures were in the middle-20s and it’s not expected to get much warmer today. We have both space heaters running in an attempt to keep the pipes flowing with water and all of us warm. Even the electric blanket didn’t feel warm enough last night to this pair of winter-newbies and it’s still only fall! The one comforting thought is that even the locals, Mainers for their whole life or most of it, are turning on their pellet and wood stoves … And some, their heat! Our kitchen cabinets were ready about a month ago but we weren’t ready for them until earlier this week. They were delivered and filled up the living room! When our contractor had installed a wall of the uppers, I realized they weren’t what I thought we had ordered. I wanted cabinets to the ceiling. No wasted space. And for some reason the kitchen designer had order 30″ uppers (not even close to the ceiling) and when our contractor found the mistake and spoke with her, we got closer (39″) but no cigar. 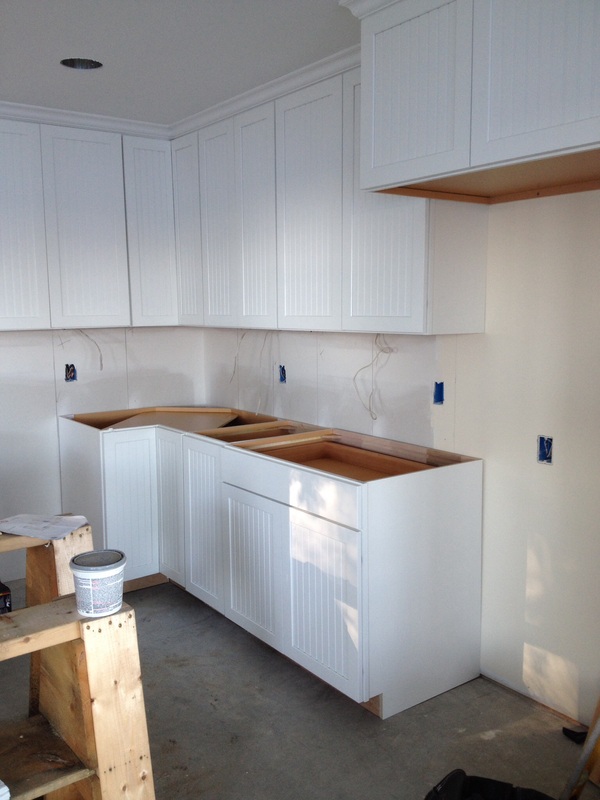 In addition, two cabinets were the wrong size … even according to our plans. Luckily, they can be exchanged. 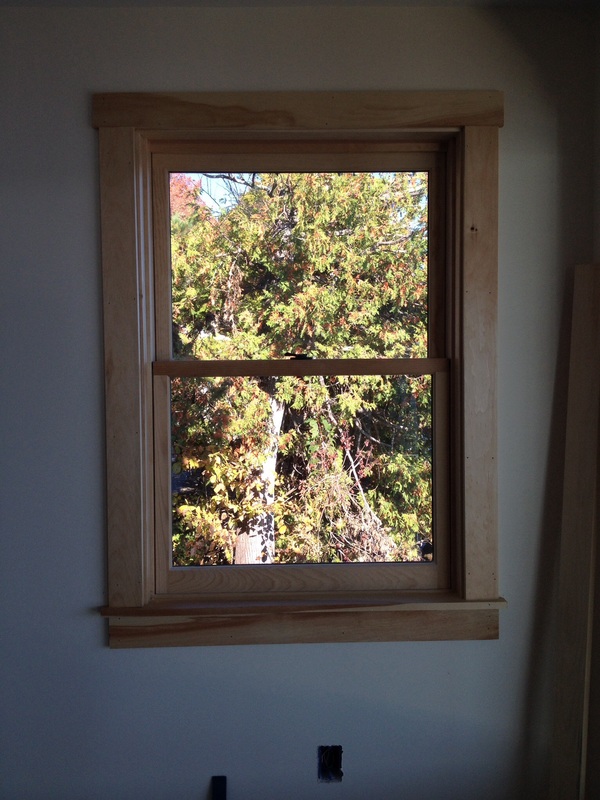 The trim around the windows and doors is going up on the first floor. It looks wonderful. The wood has gone up on the ceiling in the master bedroom and just needs to be varnished. It’s beautiful! Just what we wanted. Our tile is going up in both bathrooms. 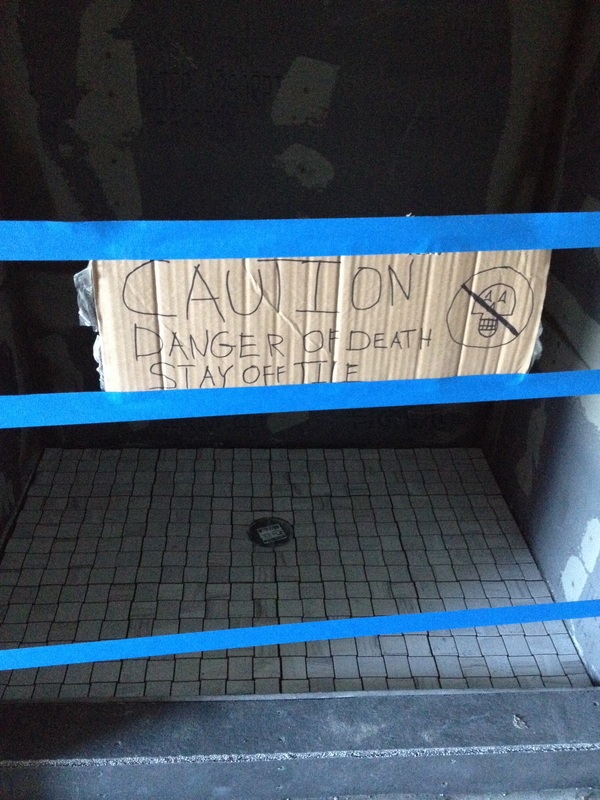 It’s wonderful to have Chris on the job with his great sense of comedy … He even hung a sign for us when he tiled the floor of our shower. I admit to laughing out loud. We are running two and sometimes three space heaters in the cabin. I had taken the curtains off the windows to clean them thinking that we wouldn’t “need” them again. I may have been wrong. It might be nice to close them to keep some of our heat inside the cabin. It’s anything but air tight! The leaves have peaked and are all falling down. While all the locals are cleaning up their yards, ours is still cluttered with construction equipment, beams from the old house and wood and metal scraps. 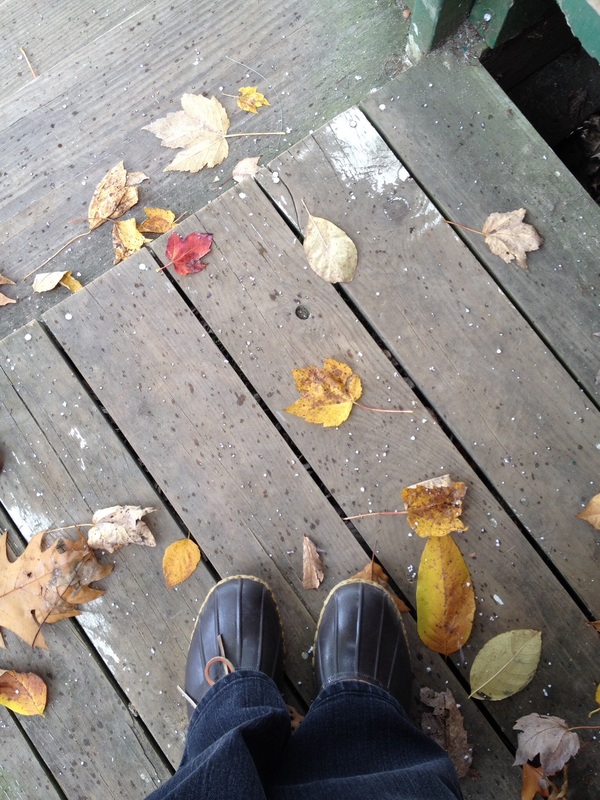 We had some snow flurries on Sunday. Early by all accounts. I even missed my Macoun apples this year. 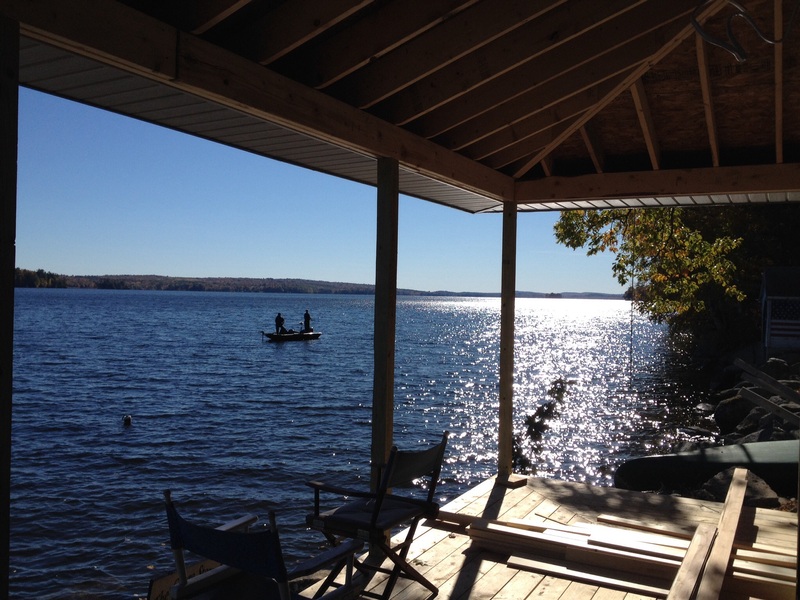 This entry was posted in Building a Home and tagged building a home, Central Maine Power, Dead River, Fall, Home Depot, kitchen cabinets, lake house, Living in Maine, Maine, Messalonskee Chronicles, window trim on October 20, 2015 by lindarockwell3. Oh my…it all looks and sounds so wonderful. It also sounds like you’ll be needing a wood/pellet stove in the new house soon. I can’t wait to see it and I’m sure there are others who would appreciate a tour by Nedley and his GoPro. C’mon Ned….get us hooked and leave us hanging? Sup? Everything looks great! First class! You’ll be cozy in no time! It looks wonderful Ned and Linda. So glad you got your kitchen cabinets as high as they can be. That is one luxury, I do not have and wish I did. It’s got to be a little warmer up there today and tomorrow. We are closing in on 70 today and tomorrow we should be above. Stay warm and get those curtains up for your heat retention.